San Jose, California: The Pacific Tree and Vine Co, 1894. First Edition. Hardcover. Very Good. After leaving lead mining in Wisconsin for gold mining in California in July 1849, Manly traveled via the Oregon Trail to Fort Bridger then attempted to float down the Colorado and Green rivers to the southwest. Upon reaching Arizona, Manly made a hard trek across desert country to southern California, where he finally arrived in 1850. The cornerstone of Death Valley literature, E.I. 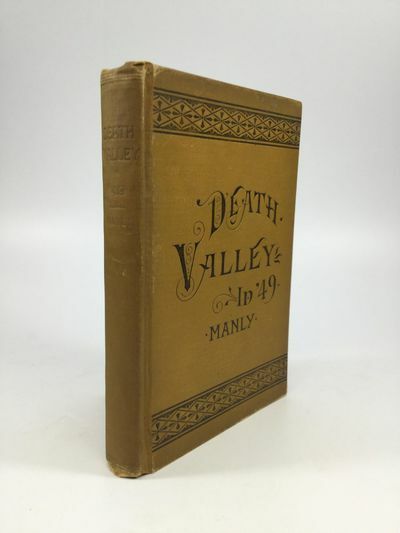 Edwards says of Manly's work, "No other book that has ever been written about Death Valley can ever remotely approach the Manly in historic importance. Not only is Manly historically sound, but the tenor of the narrative guarantees a quickening of the reader's interest." Includes the frontispiece portrait of the author, with three halftone plates and a few textual illustrations. Octavo. Original ochre cloth binding, with black and gilt stamping. A related newspaper clipping is affixed to the prefatory blank leaf. The spine is darkened, with a bit of minor fading and wear along the extremities, more so to the corners and tips; else very good. Zamorano Eighty 51.